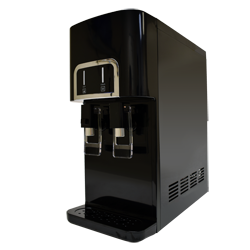 Dispensing both hot and cold water, the H2O-650 is made with surgical-grade stainless steel hot and cold tanks, and an LG compressor. The cooler is equipped with an LED-illuminated large dispensing gap and a built-in leak detector. It has a cooling capacity of 6 gph, a flow rate of 1.4 gpm, and an anti-microbial and dust-repellent coating. It is available in shell, four-stage ultrafiltration and reverse osmosis purification.